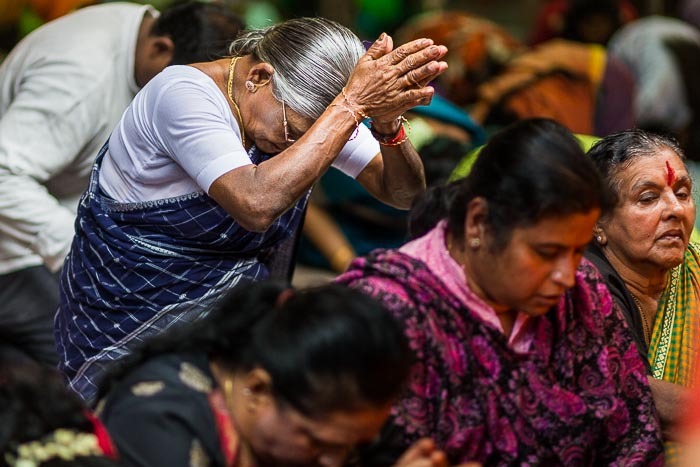 People at afternoon prayers at Sri Veeramakaliamman Temple in Singapore's Little India. I'm in Singapore for a very quick trip. I like Singapore, it's a cosmopolitan city with an energy. It's weird though, when I'm here I don't feel like I'm in Asia so much as in a hybrid place created at the nexus of Asia and Europe. The people, languages and religions are Asian but Singapore is missing the chaotic nature that marks most large Asian cities. I suspect that it's the way the founders of city-state intended it to be. It's a nice place to visit, but a little too ordered for my tastes. I prefer living in the chaos of Bangkok. The slideshow below is a few of the photos I made at the temple on this trip. There are more photos from Singapore in my archive.